The banana is an edible fruit, that from a botanical point of view, is actually a berry. 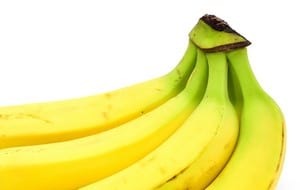 While the original wild bananas contain large seeds, bananas for human consumption are grown asexually from offshoots and have tiny infertile black specks where the seeds used to be. Practically every banana consumed in the western world is directly descended from a plant that was grown in the Derbyshire estate’s hothouse 180 years ago. They are commonly referred to as Cavendish group bananas, named after William Cavendish, 6th Duke of Devonshire. Bananas contain quite a lot of sugar and starch. Because of their high sugar content they are to be seen as a treat that should only be offered in very small quantities to your rabbit. Offer your bunny no more than 2 to 3 slices of banana per rabbit per day. It is especially important to keep the quantities small as your long-eared friend’s intestines are designed to digest grass and not food products high in carbohydrates (starch and sugar) like the banana. Can Rabbits Eat the Banana Peel? Contrary to what you might think, the peel of a banana is actually edible for both us humans and your rabbit. Our advice is to only feed the peel of organic bananas which are not treated with pesticides. This opposite to industrial banana farming which is typically pesticide-intensive as bananas are grown in massive monocultures, without crop rotation. Conclusion: even though your bunny will most likely go banana’s over this treat, be careful to only offer it in very limited quantities. Do you sometimes offer your rabbit bananas? Feel free to leave a comment.